Videocon, which was initially famous for the TV manufacturing in India, is now concentrating in Mobile market and has been releasing phones at a regular interval. Recently the company has released their new Android Smartphone, the Videocon A27, which will be boosting the companies Entry level device list. Videocon is launching a high featured android phone models at a low price which was recently observed mainly by the Indian mobile manufacturer, Micromax and Karbonn. The latest on the Videocon mobile rack is the A27, a cheap Rs.5999 android phone and is highly expected to provide a competition to the this Indian companies. If we compared this device with Karbon’s A15 we an observe that both share some similarities like 4.0 inch screen. but Videocon’s device got WVGA Capacitive Touch Screen where as Karbon A15 got TFT LCD, Capacitive touch screen, other similarity: Processor of 1.2Ghz, OS(Android 4.0) and Camera of 3 MP. The battery is also almost similar with Videocon’s device having 1500mAH and Karbon having 1420mAH. The Karbon A15 cost around Rs.500 Less than Videocon’s device. The Micromax A89 Ninja also share some common feature like Android OS, 3MPO Camera, 4.0 Inch screen and few more with this device and comes at R.500 More than this device. So the competition between this companies will be interesting specially having the device that share many common feature and available at the difference of Rs500 with each other. The Videocon A27 boasts of a 4-inch capacitive touch screen WVGA display with 480 x 800 pixel resolution and is powered by a 1GHz processor paired with 512MB of RAM. The A27 gets 4GB of on-board storage, which can be expanded by up to 32GB using a micro-SD card. It will be operating Android 4.0 (Ice Cream Sandwich). Catching on the need for multiple SIMs in the Indian market, the Videocon A27 is a dual-SIM phone and can function both SIMs at the same time. The Smartphone houses a 3 megapixel camera at the back along with a front-facing VGA camera, which can be used for video calling. The connectivity options on the device include 3G, Bluetooth, Wi-Fi and GPS. The Smartphone also packs-in a 1,500mAh battery and comes pre-loaded with a few applications like TOI, ET, Facebook, Saavn, Fun Zone and Movie Studio. Dual Sim: Yes (GSM + GSM) with Dual Standby. External Storage: MicroSD card support for up to 32 GB. Connectivity: 3G, Bluetooth 3.0, Wi-Fi 802.11 b/g/n, GPS, 3.5mm audio jack, FM Radio with recording. 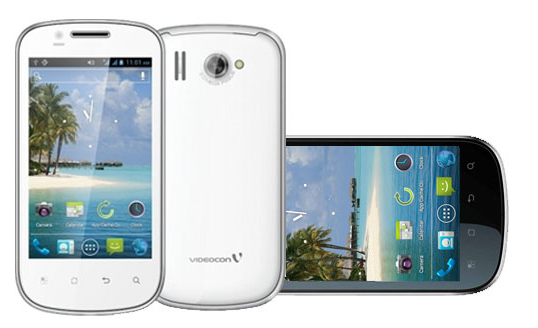 The Videocon A27 is priced at Rs.5,999 and is available across India. The Videocon A27 packs a 1GHz processor and 512 MB of RAM but has the lesser RAM which might cause the device to lag, but still at Rs 5999, we’re happy with the processor as well as the RAM capacity. The phone has a rear end 3 MP camera and a basic front camera for video-calling and with the low camera pixels and lesser RAM might hurt Videocon sales but the phone is a neat buy for the price. The specs is really impressive, specially for price tag of Rs 5,999. The Smartphone is available in the market in two color options – black and white.